Matthew is a hugely talented stand-up who started on the circuit in 2002 and went on to win SO YOU THINK YOU’RE FUNNY the same year. In 2003 was named CHORTLE BEST NEWCOMER. Since then he has performed on the UK circuit and abroad in France, Belgium and Monaco. As well as supporting HARRY HILL and AL MURRAY and appearing as part of THE COMEDY ZONE at the 2003 Edinburgh festival. Other work includes appearing in SPANKING NEW ON 7 (BBC Radio 7), a programme featuring the most promising new stand up talent and as part of JONGLEURS LIVE, a collections of CD’s showcasing the 'Freshest and Funniest' acts on the circuit. 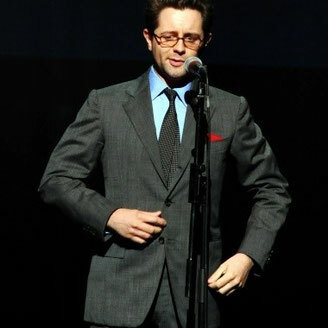 In 2005 Matthew took a break from Stand-up to concentrate on his writing, in which time he developed a number of plays, sitcoms and sketch ideas as well as writing his first book LEISURE. Since returning to the comedy circuit in 2007 Matthew has picked up where he left off appearing at some of the UK’s leading clubs, including Jongleurs, Banana Cabaret, Headliners, The Comedy Café, The Frog And Bucket, Up The Creek and Downstairs At The Kings Head and was named the 2009 ENGLISH COMEDIAN OF THE YEAR. Matthew has just returned from Edinburgh where he wrote and starred in Shopping Centre. His sellout play from 2011 CUL DE SAC starring Alan Francis will run this Christmas at Theatre 503. "The writing is sharp, the observations are acute. The dialogue sparkles, and an experienced and professional cast make it work beautifully." "Osborn's Script is as crisp and polished as you might expect if you know his stand-up, and delivered accordingly, with clarity, precision and a fine sense of how each line should be timed." "If George Orwell had been around to write an episode of Terry and June, he might well have turned in something like this three-hander by Matthew Osborn. Or what starts out as a front-lawn comedy of manners - very bourgeois, very buttoned-up, very English - becomes a kind of Nineteen Eighty-Four with laughs.